The clear button is gray and I cannot click it. I would like to clear notifications so that the bell icon doesn't show. I have tried clicking on the notifications and they still don't disappear. Even if you have 0 new notifications, this indicator will still appear to provide quick access to the applications that make use of it and the associated actions. The indicator's general presence is not an indication of new notifications. 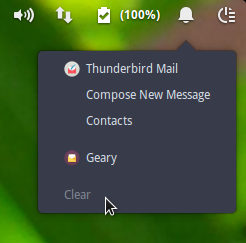 If you are using the default icons, the styling of the icon will change to indicate new notifications. It is unknown whether the icons you have chosen to use make that same distinction.